Take it from me ladies; the makeup world is complicated! There are so many products that do so many things, how do you ever know what you actually need? 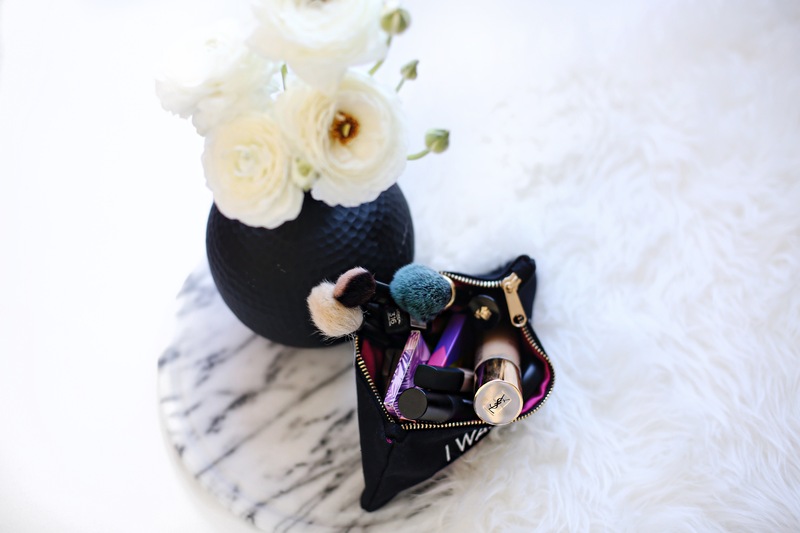 If you’re just starting out or if you’re looking to simplify your makeup bag, today I am sharing with you 7 things every girl needs in their makeup bag. I’ve categorized these in sections and I have my favorite product recommendations below each section. if you have a favorite product I missed, leave it in the comments below so we can all discover new things. This could be a number of things depending on your skin type. You may just need a tinted moisturizer in your makeup bag to even out your skin tone, or a foundation for extra coverage. A base will help create a smooth and even “foundation” (see what I did there?) for the rest of your makeup. There are so many types of concealers in the market, but I recommend one that’s two shades lighter than your skin. A brightening concealer in your makeup bag will help you conceal and highlight at the same time. 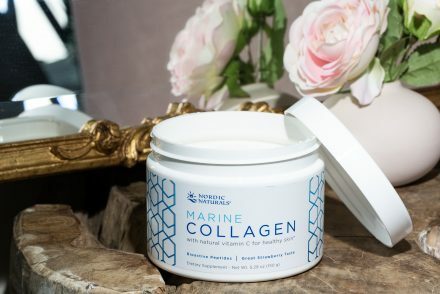 Keep this one in your makeup bag or your clutch when you’re on the go; it’s a life saver! A dusting of setting powder will help set your foundation to last all day. Also, when you’re getting a little bit shiny, a sprinkle of setting powder helps take away the shine. Have a bronzer in your makeup bag for a simple contour, or just to add color to the face. A bronzer can work for all seasons, and again, has so many uses. 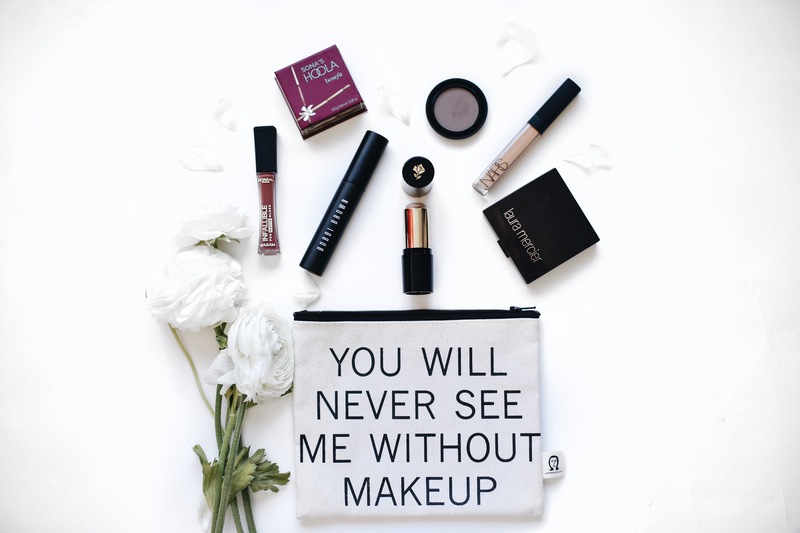 You can even use it as an eyeshadow to keep your makeup bag at only 7 items! Mascara is a MUST in your makeup bag! A couple coats of this miracle product and your eyes open up dramatically! For every day, a little bit of mascara goes a long way and can be all you need. A lipstick, whether that be in a gloss or a matte finish can tie your look together and complete a simply gorgeous face. Have a go-to shade in your makeup bag at all times to touch up if/when you need to. Having a solid, filled-in brow really helps give shape and structure to the face. Add an eyebrow powder or a pencil in your makeup bag to even up your brows and fill in the sparse areal. I also use my brow powder as eyeliner at times. I hope this list helps you put together your first makeup bag or downsize to just the right amount of things you need! Once you have these 7 items together, you can start to add other things like shadows and liners if you want to. 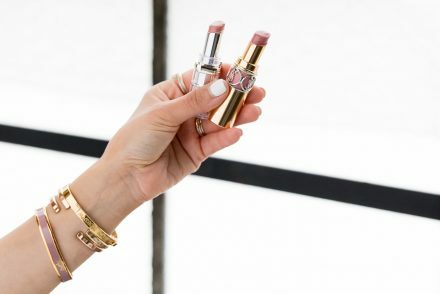 But these 7 items together can help you create an easy, fresh face on the go that’s natural and gorgeous – just like you! haha no worries. Even if you have 10 items, that’s still pretty good. That’s a great one. Even if you add a face highlighter, you can also use it on your eyes. I’ll def. try some of the new Tarte goodies I got in future videos. Love your tutorials, recommendations and style. I have a question on the brushes you used in this video, specifically the double ended brush you used when you blended in your concealer. It looks so soft. What brand and number is that brush? Thank you so much for the video and blog! Just what I needed – I am learning loads ☺️ I wanted to ask if you could please do a “what brushes to pack” video/blog also to complement this blog? Thank you! Lots of love from South Africa ? Great idea! Thanks for the request!! Hey, thanks Sona for this video! I love it! I wanted to keep a small make up bag that can easily be switched from purse to purse! Awesome suggestions. I was wondering if you could do a brushes 101 video? I’m new to make-up and brushes are a whole new world to me. I just have basic ELF brushes. I wanted to know which brushes are the essentials. Love your videos!!! Hey sona! I love your videos! Your amazing and talented. Any recommendations on morphe brushes that you can use for the Bronzer, concealer or highlighter and contour? Or any other good brands? Real techniques are pretty amazing brushes and very much affordable you will love them also a little bit more high end I know Sona uses a lot of the sigma brushes ?? Thank you for the list! I like to keep rose water mist in my makeup bag to refresh my skin throughout the day. What brush did you use to do your eyebrows? I’ve actually been meaning to downsize so this blog post was super helpful! Just wanted to say that I love your YT videos and blog. I watch every single video and read every single blog post. I love your makeup tips and your fashion sense! Following you has been amazing! So glad I found you when you started your YT channel. Just wanted to let you know that since I don’t comment often enough! Also a handbag collection would be pretty cool. 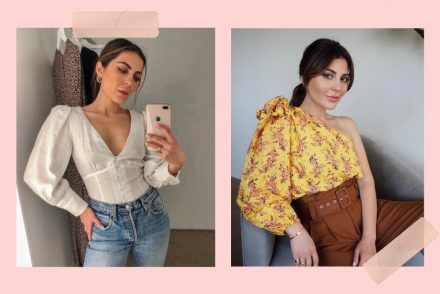 All of your pieces work beautifully into your wardrobe! Love you so much Sona!! OMG, you are amazing! ?? Hello from Greece!I really enjoy watching your videos!could you please suggest lip colours that last all day?thank you! hi sona what shade do u use in the ysl foundation? ?? Hi Sona, thanks for this post i absolutely love Hoola bronzer from Benefit! Just started following you and love your look! What is the double ended brush you use for foundation and your concealer? Thanks! Never mind, saw you posted it in the comments! This is wonderful!!!! I feel that there is so many products available which can sometimes be overwhelming and expensive. This article is perfect just what I was looking for. Looking forward to putting my makeup bag together. Thanks for sharing!!! Loving your videos! What amazing tips. I am having the hardest time with concealer under the eye. It either creases, looks cakey, shows too many fine line or just looks like nothing happened . What can a girl do? Does the loose powder cause the lines to show up more but without it how do you set your make up? How do you stop the makeup from going into blotchy cakey look but still get awesome coverage? You could do a whole video on concealer, its the one thing we all need and need it to be done right. Thanks, you’re great! Hey Sona, Loved the video on this blog post. I especially loved the way you used the hoola bronzer as a contour/bronzer, and an eyeshadow. Genius! Do you have a recommendation for a matte bronzer like this for those with darker skin tones (mac NC50)? I was thinking one of the MAC pro sculpting powders (maybe in the shade definitive). what are your thoughts? I will prpobablyu change one, I will put highlight instead of Lip! hahaha love you! I have oily skin, whenever i do make up i end up getting too much oil on skin it shins nd looks really bad. What can i do to stop this??? I always bring my roadeavour’s travel toiletry kit wherever i go!